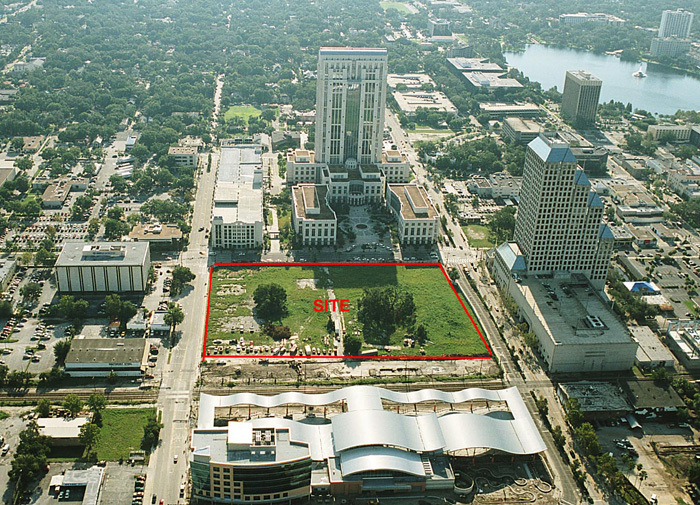 The site encompasses an entire key block in downtown Orlando. Orlando Central Plaza is currently an empty site that encompasses an entire key block in downtown Orlando, but it has the potential to become a center of community life and activty. A major new development is currently being planned for the site that will include office space, retail, a hotel, restaurants, a train station, and a central civic square. The development team, led by the Palm Beach Land Trust, brought in Project for Public Spaces to assist with creation of a development that will become one of the great destinations in downtown Orlando, and to ensure that the plaza and retail spaces are vibrant, attractive and successful public spaces. 1. Built Bridges: Through a public presentation, PPS built consensus among a group of diverse stakeholders regarding the public space goals of the project, and initiated a positive relationship between the development team and city officials and agencies. PPS also built an understanding within the development team concerning the key components and attributes that are needed to create a successful public space, and how to go about achieving them. 2. Advised Development Team: PPS worked closely with the development team on the master plan for the entire project, focusing especially on the concept plan for the future civic square and adjacent streets and public spaces. 3. Created a Marketing Tool: To generate interest among potential tenants in the facility, PPS created a booklet describing the goals and vision for the development. 4. Proposed Management Strategy: PPS is currently developing a management strategy for a private entity that will manage and program the public spaces. The project's tenants will have a unique opportunity to partner with the management and participate in hosting events and activities in the square. 5. Assist through Construction: To ensure that the project vision is not lost in the final design and construction phases, PPS will assist the development team through the final stages of the project. Integration of transit into the complex and its urban square to create a true transit-oriented facility. The ultimate goal of the new development is to create one of the great destinations in Orlando that offers places and activities that will draw people to it on a daily basis, where friends will gather and where everyone will savor an authentic urban experience. Project planned with public appeal: A downtown block's makeover adds something extra to the offices, condos and shops: space for relaxing. Orlando Sentinel, January 8, 2006. David Barley Chooses Place Over Space, Orlando Business Journal, July 1, 2005.